Painting the American West explores how today's artists look at, think about, and interpret their observations, thoughts, and emotions about the western landscape in paint. 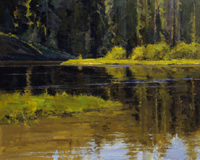 Paintings will range from plein air to studio paintings that utilize sketches and/or photographs as references and those that rely on historic images to articulate a response to the landscape. Participating artists are Linda Lillegraven and Joe Arnold (Laramie); T.A. Lawson (Maine); Stephen Hannock (New York City); Joellyn Duesberry (Denver); Skip Whitcomb (Fort Collins); and Scott Christensen (Jackson Hole). From such British landscape artists as John Constable and the French artists of the Barbizon School, a direction in landscape painting arose based on direct observation. Often these artists would sketch plein air and return to the studio to paint their large easel paintings. Their depictions were naturalistic and romantic, conveyed by loose, tactile brushwork, and approach and execution that is quite unlike the Luminist surfaces of the later Hudson River School. Today, the landscape continues to inspire artists, and the landscape of the American West is a favored subject. But just what is the creative process these artists employ? For T. A. Lawson, working plein air offers the spontaneity of responding directly from the landscape. Linda Lillegraven utilizes the photographic sketch as a reference for recalling the emotional "feel" and "look" of a place. Joe Arnold combines the tools of the plein air and photographic sketches as research for his studio paintings. Similarly, Skip Whitcomb works in field notebooks and plein air sketches as references for his paintings that may be executed in either oil or pastel. Scott Christensen and Joellyn Duesberry employ processes of field sketches and painted sketches to arrive at their final easel painting. For Stephen Hannock, the historical reference to place both from the perspective of "view" and personal notations sets his work apart in a different direction altogether. Funded in part by PacifiCorp, the National Advisory Board of the UW Art Museum, UW Cultural Outreach, and the Wyoming Arts Council through the National Endowment for the Arts and the Wyoming State Legislature.